Shawn Peter Raul Mendes (born August 8, 1998) is a Canadian singer-songwriter. Mendes first started posting cover videos on the popular social video app Vine in 2013 and gained millions of views and followers in a few months, becoming well known for his six-second snippets of renditions of many popular songs. By August 2014, he was the third most-followed musician on Vine. Artist manager Andrew Gertler discovered Mendes online in January 2014, bringing him to Island Records where he eventually signed and released his first single "Life of the Party" in June 2014. He became the youngest 15-year-old artist to debut in the top 25 with a debut song on the US Billboard Hot 100, making it to number 24 for the week ending July 12, 2014. Prior to his signing, Mendes toured as a member of the Magcon Tour alongside other young Viners with a large following on social media. Mendes was also on a nationwide tour with Austin Mahone as an opening act, releasing his debut major label EP in July. The EP debuted and peaked at number five on Billboard 200, selling 48,000 copies in its first week. He won a Teen Choice award in 2014 for Webstar in Music. On September 5, 2014, "Oh Cecilia (Breaking My Heart)" featuring Mendes was released as the fifth single from The Vamps' debut album, Meet the Vamps. 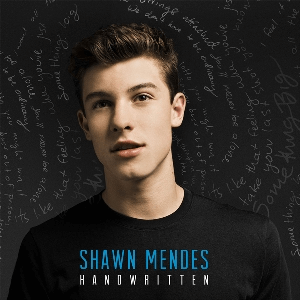 On April 14, 2015, Mendes released his full-length album Handwritten, which debuted at number one on the Billboard 200 chart with 119,000 equivalent album units, selling 106,000 copies in its first week. The third single from the album, "Stitches", peaked at number four on the US Billboard Hot 100, becoming his first top 10 single in the US, and reached the top position on the Mainstream Top 40 chart. The song later reached number one in the UK. Mendes recorded a song called "Believe" for Disney Channel Original Movie Descendants. Also in 2015, Mendes opened for Taylor Swift during 1989 World Tour dates for North America. In late 2015 Mendes and Camila Cabello, released their collaborative single "I Know What You Did Last Summer". The song was included on Mendes' Handwritten Revisited reissue. He appeared on The CW's The 100 third season premiere on January 21, 2016. He later announced his second world tour as a headliner, which will visit North America and Europe, starting in March 2016. Mendes signed with modeling agency Wilhelmina Models in early 2016. Mendes was listed among Time's The 25 Most Influential Teens in 2014 and 2015. He also made his first appearance on a Forbes list with their annual "30 Under 30", for 2016. Mendes released "Treat You Better", the lead single from his second studio album Illuminate, in June 2016. The single reached the top 10 on the Billboard Hot 100, while the album debuted at number one on the US Billboard 200 with 145,000 equivalent album units, including 121,000 in pure album sales. The album foray into "a soft classic-rock groove" in his new direction. "Mercy" released as the second single on August 18, 2016. Mendes released the live album Live at Madison Square Garden in December 2016. I find Treat You Better so relatable now. But Mercy & There's nothing Holding Me Back are far superior singles, especially Mercy. He should've made no Promises a single too. It's top 3 in the best albums of the year, so that'd be wise. I wanna sniff his pits. Also can he make Youth & Where Were You In the Morning? singles already...I need good videos this era. His arm pits are wow. Don't be racist. But yes, it's a good song. There are far better off the new album tho.